With a range of performances from detergents to personal products, Sodium Hydroxide is better known as the active ingredient in “lye” relaxers. As such, she brings with her the promise of straightforward beauty. She makes us dream on long shiny hair floating in the breeze of the morning, long strokes of brushing and cute ponytails. She embraces this role with such a fervor that we forget she is also an important part in the sink declogger business or that her performance is so corrosive that can dissolve through glass. Rumor has it that working with her is not easy, simple and clean, as it may appear on the box. She strongly believes that behind the scenes is nobody’s business. Her curl-hate is legendary. Flat irons? Amateurs. Sodium Hydroxide goes for the molecules and when a hair has been relaxed, those natural curls won’t ever, ever be the same. Scalp scarring, lesions, hair loss and potential blindness, common consequences from frequent or improper use seem unimportant to her; straight beauty is her goal and motto. Slightly air headed, when recently asked about studies linking her with uterine fibroids in African Americans, she giggled. Sodium Hydroxide, otherwise known as lye, is found in everything from detergents and personal products to cleaning solutions for crude oil. She also has a starring role is in many sink de-cloggers. She is, of course, most famous for her lessening effects on textured and ethnic hair. Sodium Hydroxide works as a relaxer by breaking down the molecules in the hair permanently changing the structure of the hair. Hair that has been relaxed will never have a natural curl pattern again. The hair can be significantly weakened by the physical overlap of excessive applications or by a single excessive one, leading to brittleness, breakage, or even widespread alopecia. Recently, there has been a study linking uterine fibroids to relaxer use in African Americans women. This may come to no surprise since she is consistently noted as one of the most corrosive substances on earth. When used in relaxers, NaOH can be a “gateway” chemical, by allowing other chemicals to seep into the body through the damaged or burn flesh caused by NaOH. This chemical is also used in food preparation including brine olives, Chinese noodles and pastries, German pretzels, and the thickening of ice cream to name of few. 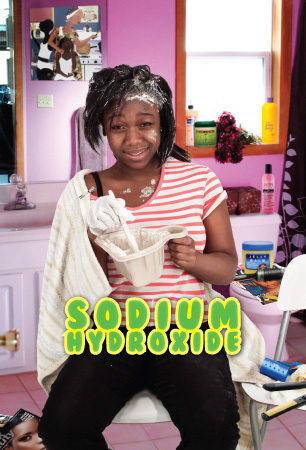 Sodium Hydroxide was prominently featured in Chris Rock’s 2009 documentary, Good Hair. The film followed Ms. Hydroxide’s rise to fame and her compulsive personality. She is so addictive that sometimes her fans refer to her as, “creamy crack”. Because of the corrosive nature of NaOH, contact with flesh can cause burns and lesions including permanent scarring. Blindness can occur if contact with eyes. In addition, NaOH can cause severe damage to hair if used improperly including the weaking of the hair follicle and breakage. Scarring and lesions on the scalp can cause permanent hair loss.